Tea Party Strains GOP's Ties To Big Business : It's All Politics The GOP can still reasonably claim to be the "party of business." But it's clear there's a significant amount of tension between the Republican Party and the business community. 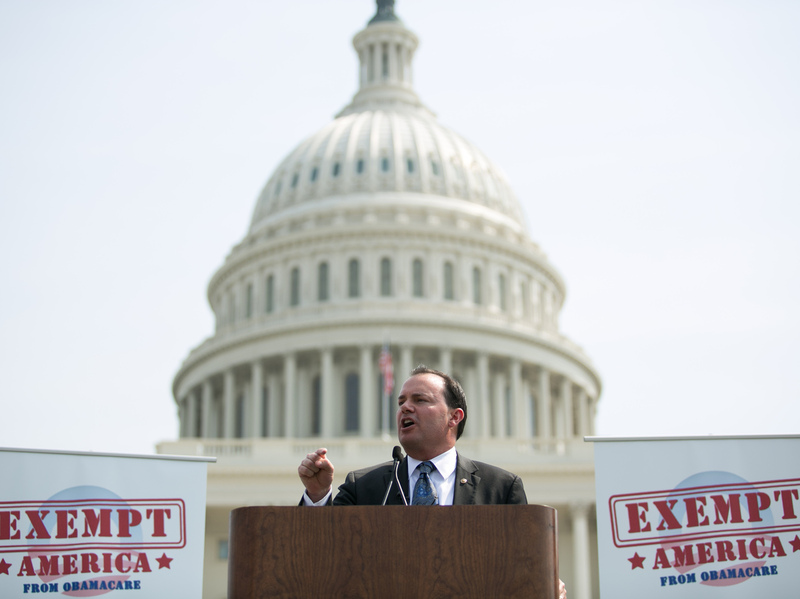 Sen. Mike Lee, R-Utah, speaks at a Sept. 10 Capitol Hill rally against Obamacare. Is the GOP still the "party of business"? With the party's long-standing and ongoing push for lower taxes and fewer regulations — both in Washington and in state legislatures — Republicans can reasonably make that claim. Yet some of the congressional Republican rhetoric in the battle over a continuing resolution, the debt ceiling and defunding Obamacare makes it clear that there's a significant amount of tension between the party and the business community. Much of the strong language comes from the Tea Party and its friends on Capitol Hill. In his 21-hour marathon speech in the Senate this week, Sen. Ted Cruz of Texas spoke of the need to listen to the little guy rather than the CEOs and titans of business. At a recent rally on the Capitol grounds, Utah GOP Sen. Mike Lee decried the exemptions big business has gotten from the White House on Obamacare — lumping that group in with what he calls the president's "cronies." He was cheered when he asked the crowd, "Is that fair?" The Tea Party crowd answered with a resounding "Noooooo!" And it's not just this particular summer of discontent that has driven this narrative. Conservative voices in the party have been grumbling about big business since the law known as TARP — passed in late 2008 in response to the mortgage crisis — was signed by President Bush with strong backing from Wall Street and the business community. Then came the auto industry bailout. More GOP outrage. Toss in the U.S. Chamber of Commerce's calls for passage of comprehensive immigration reform, and it's easy to forget that the GOP and big business have long been close allies. Last week the chamber sent a letter to members of the Republican-controlled House, urging them not to flirt with a government shutdown. The correspondence warned that such threats, combined with the talk of not raising the debt ceiling later this month, could trigger disruptive consequences for an economy that's already underperforming. "I like to deal in reality," says Bruce Josten, the business group's top government affairs officer. That reality, he explains, is the need to deal with things like entitlement reform, fixing the immigration system and protecting the full faith and credit of the U.S. government. As for the politics of all of this, Jack Pitney of Claremont McKenna College says Republican members of Congress come mostly from safe GOP districts — which means they are worried about pleasing the activist voices in their party. Right now, that often means the Tea Party. Pitney says the debate over defunding Obamacare indicates that the activists, and not the business community, have captured the attention of GOP officeholders. Against that backdrop, the chamber hosted an event at its Washington headquarters this week. The keynote speaker was former Indiana Republican Gov. Mitch Daniels. Asked about the battles this week in Congress, Daniels, who is now president of Purdue University, says he hopes the parties get past this current skirmish. A budget needs to be passed and a shutdown should be averted, he says. Further, Daniels called the Chamber of Commerce an important institutional voice — one that he hopes it will use more loudly.